How Much Water Should A 6-Month Old Female Cocker Spaniel Drink? 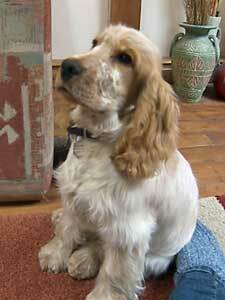 How much daily water should I give my 6-month old female cocker spaniel? She's marking on my rug - maybe I am giving her too much water? I think the answer could depend on many things such as what she eats, how much exercise she gets, how big she is, whether it's warm or cold outside. All these factors may influence how much water your cocker spaniel puppy will need. If she eats dry dog food, ie kibble or biscuits, she may need to drink more than normal as there is very little moisture in dry dog food. If she's fed on tinned dog food, she shouldn't need as much as it has a much higher water content. If your cocker is fed human food, check the salt content. It's recommended that you don't add any salt to your puppy's food because too much salt is not good for her. Is she given dry dog biscuits during the day? Does she have access to any other food sources? I would recommend that you leave her with a bowl of fresh water each day and keep an eye on how much she's drinking. You shouldn't need to refill her water bowl during the day (especially if it's not too hot outside). If you are having to refill her bowl more than say twice each day, perhaps you should check with your vet just to confirm that she's okay. I am assuming that she's fully house-trained and that she's just started marking your rug. If she's not, or she has regressed, you can learn more about potty training here. I recommend you take her through her paces again. When you cleaned her mess up did you use a specialist pet urine spray? If you didn't, although it will look clean and you won't be able to smell it, she will, and it may be encouraging her to go again in that area. The answer to this would be to buy a specialist pet urine remover to clean your rug. Alternatively, she may simply need to be let out more often. Other than that, I'm afraid I can't help you further. If you've tried all of the above, the only other course of action would be to take her to the vet to see if there's a medical problem causing her to pee so much. Let's hope you find something here that works for you! Comments for How Much Water Should A 6-Month Old Female Cocker Spaniel Drink? I'd give her as much as she wants to drink. If you notice her water bowl is empty, fill it up. Just remember to let her outside to pee otherwise you're going to have soggy carpets!